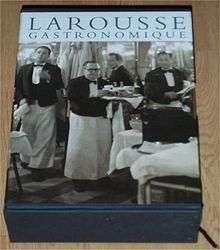 Larousse Gastronomique (pronounced: [la.ʁus ɡas.tʁɔ.nɔ.mik]) is an encyclopedia of gastronomy. The majority of the book is about French cuisine, and contains recipes for French dishes and cooking techniques. The first edition included few non-French dishes and ingredients; later editions include many more. The first edition (1938) was edited by Prosper Montagné, with prefaces by Georges Auguste Escoffier and Philéas Gilbert. Gilbert was a collaborator in the creation of this book as well as Le Guide Culinaire with Escoffier, leading to some cross-over with the two books. It caused Escoffier to note when he was asked to write the preface that he could "see with my own eyes," and "Montagné cannot hide from me the fact that he has used Le Guide as a basis for his new book, and certainly used numerous recipes." The third English edition (2001), which runs to approximately 1350 pages has been modernized and includes additional material on other cuisines. It is also available in a concise edition (2003). A new, updated and revised edition was released on 13 October 2009 published by Hamlyn in the UK. James, Kenneth. Escoffier: The King of Chefs. Hambledon and London: Cambridge University Press, 2002. Larousse Gastronomique, Prosper Montagné, maître cuisinier, avec la collaboration du docteur Gottschalk, Paris, Editions Larousse, 1938.